Well, not really stolen! It’s not our plant, but it does grow over our wall. So we get some of the pleasure from it! It is so beautifully scented! A real heady scent – even better at night. We are so lucky that it comes over the wall just by our dining area. 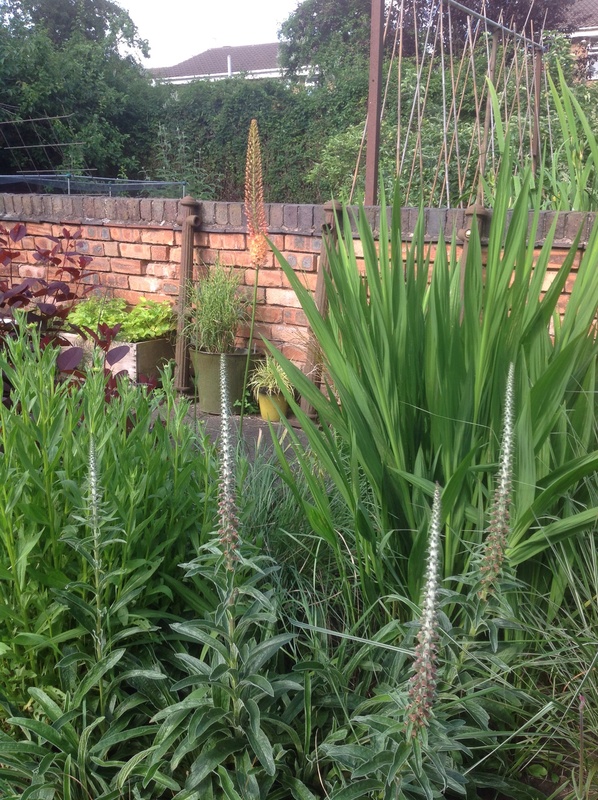 It mingles with our Trachelospermum prior to their flowering. I did ask my neighbour which honeysuckle it was. I was thinking of getting one for myself. (Then I realised that there was little point – I sort of had it anyway!) If I remember correctly, he told me it was “Hall’s Prolific”. I have looked it up, and it does seem to fit the description. White, sweet scented flowers, that fade to yellow. It’s described as a sweet vanilla scent. I can’t really detect vanilla, but lovely nevertheless. And, as they state, even stronger in the evening. A perfect addition to the patio! 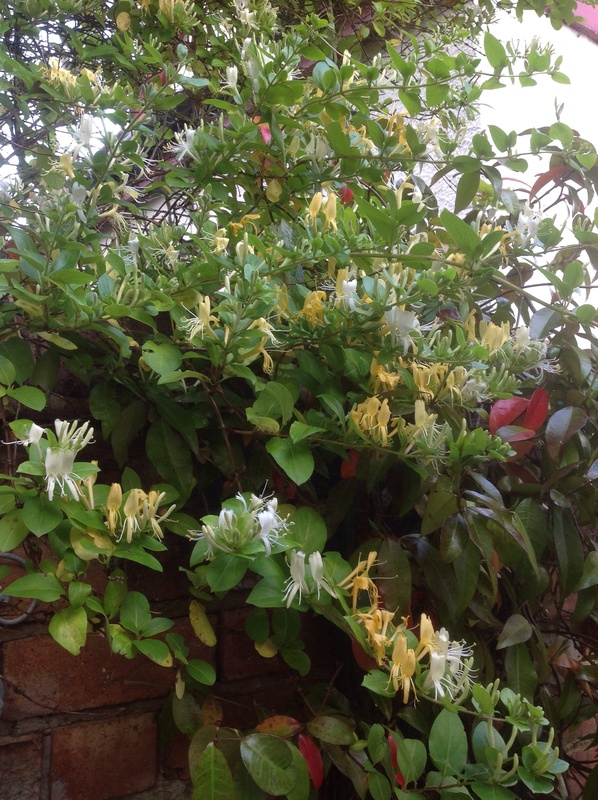 This entry was posted in The Scented Path and tagged Lonicera, Scented shrubs on June 29, 2014 by thelonggardenpath. Roses are not the only scent. Our roses this year have put on a magnificent display. As you can imagine, the scent, walking through the garden has been intoxicating. Mind you, the roses haven’t had it all their own way. There’s been a bit of a scent battle going on in the Cottage garden of late. The lawn has become a bit like a boxing ring! “On my right, we have …. THE ROSES!” “And on my left, we have…. PHILADELPHUS!” It all depends on the direction you’re ambling in, or the direction of the breeze, as to who wins that round! To put you in the picture, the Cottage garden centres around the lawn. 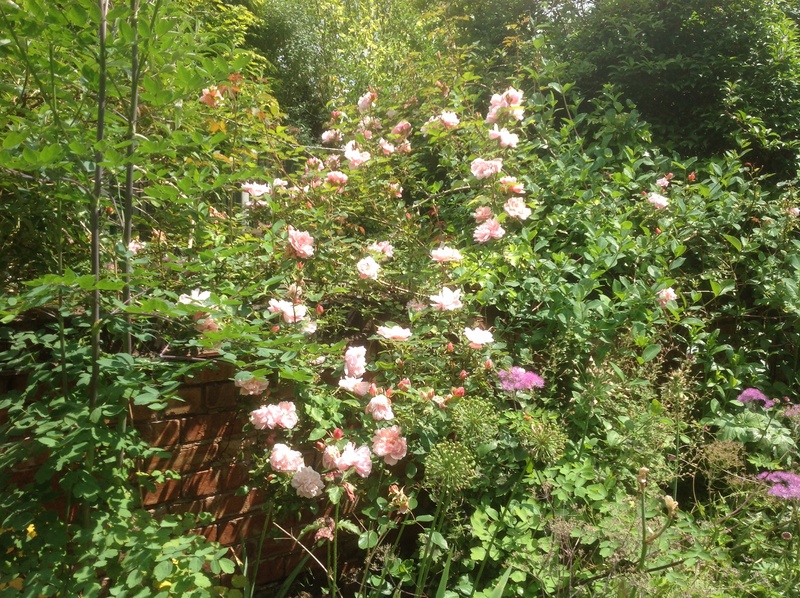 On the right is our cottage border, with the roses and other lovely cottagey plants. On the left is the scented shrub border, home to (obviously) the majority of our scented shrubs, which has been planted with the aim of providing scent all year round – which, I’m pleased to say, it does pretty much achieve! 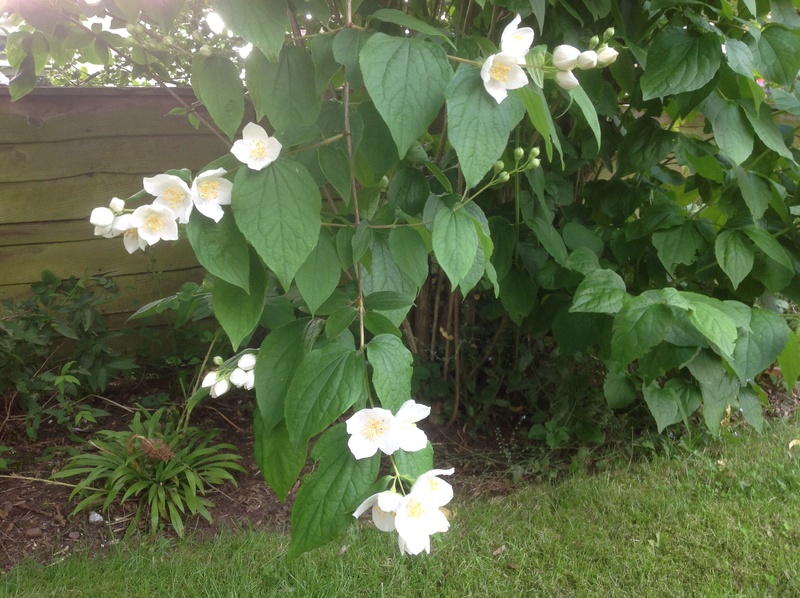 Here is home to our Philadelphus – hence the battlefield! 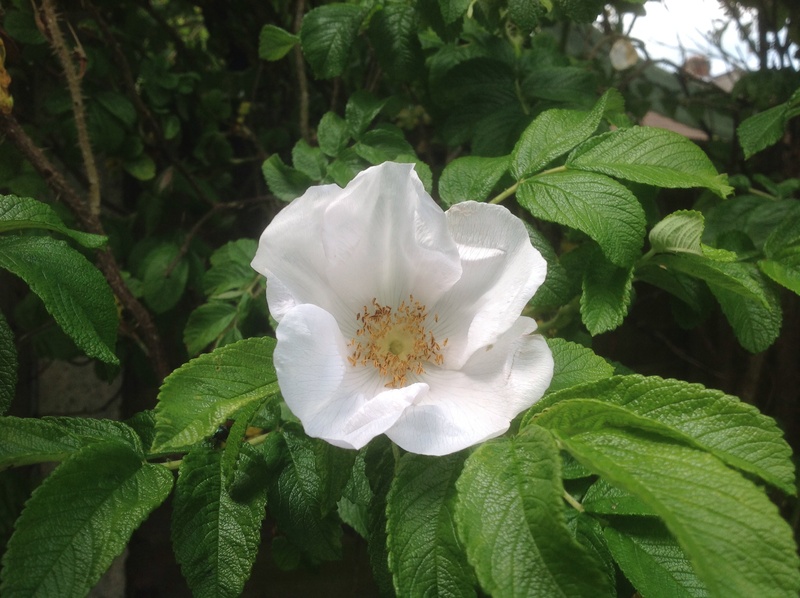 So back to the battle of the scents, between our Roses and our Philadelphus. The alternative name of Mock Orange will give some idea of the serious competition between the two. “Sybille” is a lovely, delicate shrub, no more than 3-4 ft high, with single white flowers, which have a purple blotch at the centre. 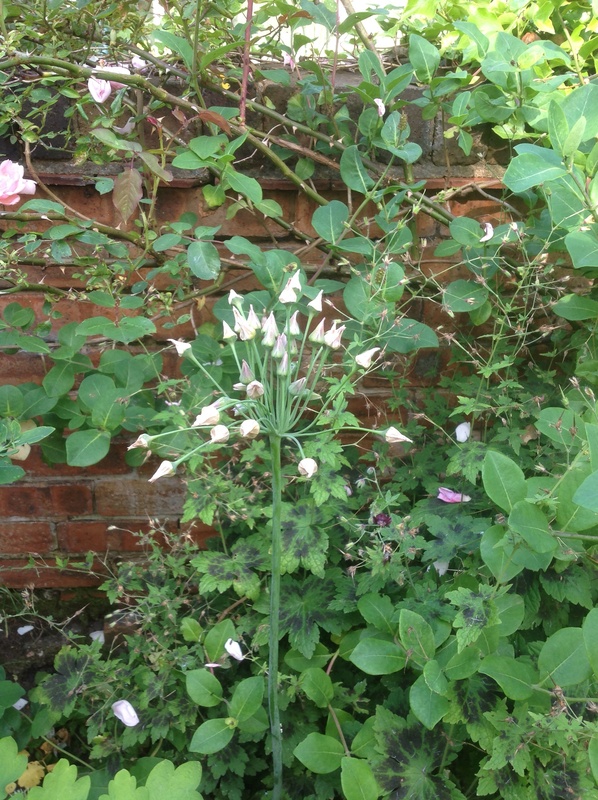 The scent is gorgeous – like bubblegum or tutti-frutti! “Virginal” is a different beast altogether. A very vigorous grower, that, despite pruning as per the manual, seems to go berserk, reaching heights of 8-10 ft. It is ungainly as a shrub, and if it wasn’t for its showers of beautifully fragrant (a different scent to Sybille, by my nose!) 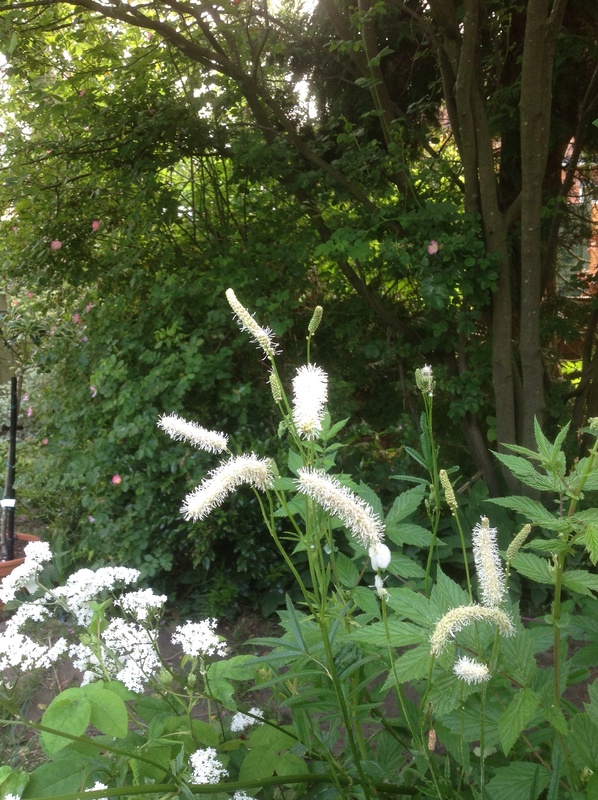 pure white flowers, it wouldn’t be worth its keep. But for now, it’s easily forgiven. It just needs a firm hand! I have to take you here to update you on what’s happening now. The focal point is the Eucalyptus, now starting to reveal its magnificent bark, as well as its aromatic leaves, though it does need a bit of heat to appreciate the latter. 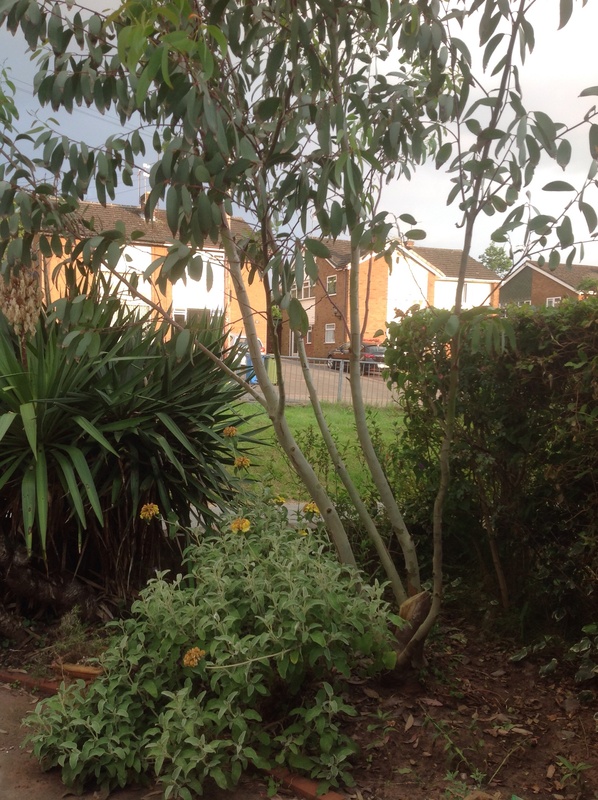 Under its canopy is a Phlomis fruticosa, which is coming back after a severe haircut. 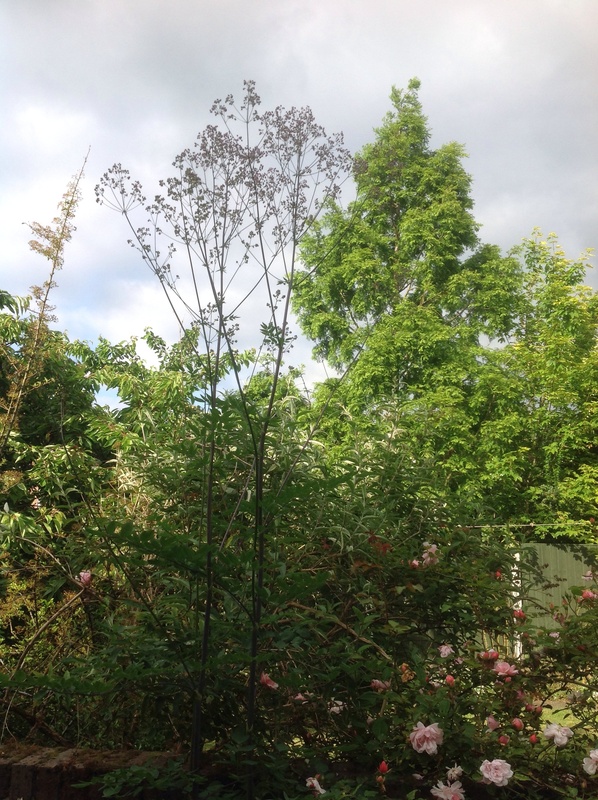 It has felted, silvery aromatic foliage, similar to sage, but the flowers, although not scented themselves, make a dramatic statement – whorls of yellow flowers arranged around the stem, that give way to sculptural seed heads. 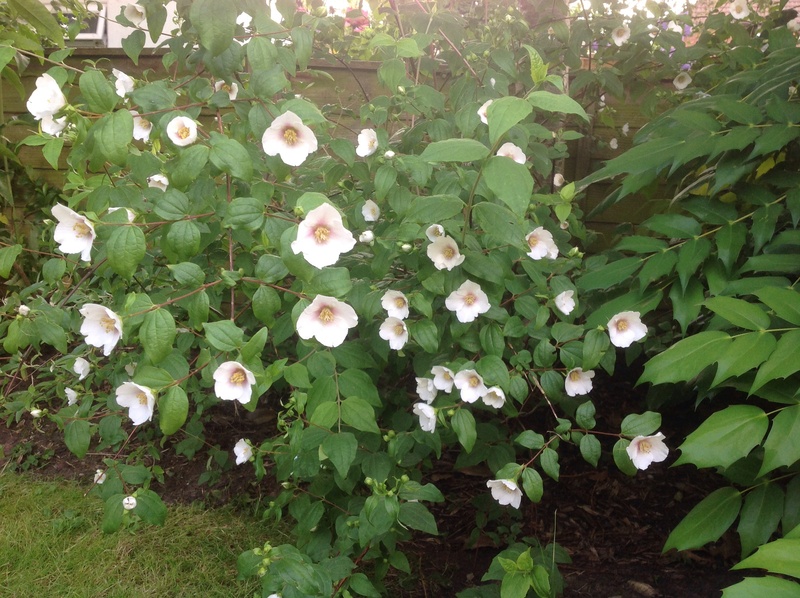 This entry was posted in The Scented Path and tagged Cottage border, Philadelphus, Roses, Scented shrubs on June 28, 2014 by thelonggardenpath. 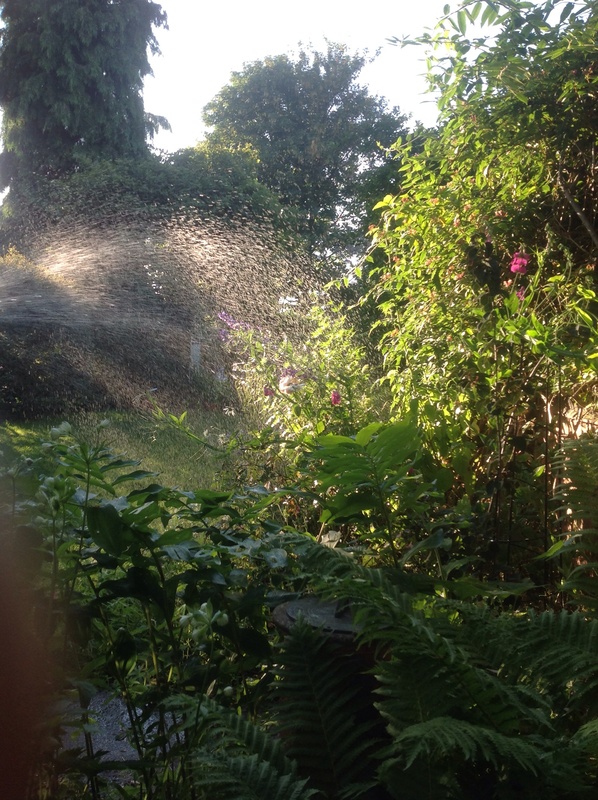 This entry was posted in Uncategorized and tagged Wordless Wednesday on June 25, 2014 by thelonggardenpath. 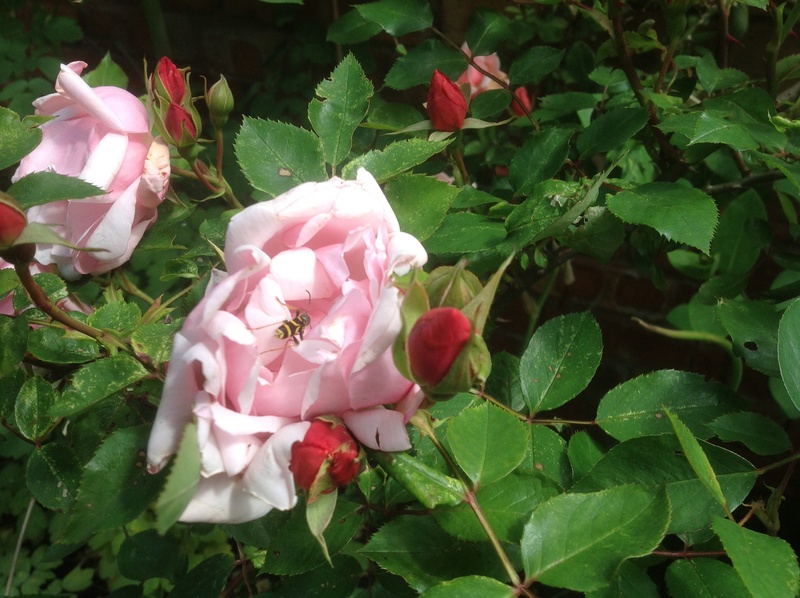 ….by virtue of the fact that I consider myself unable to grow roses well. 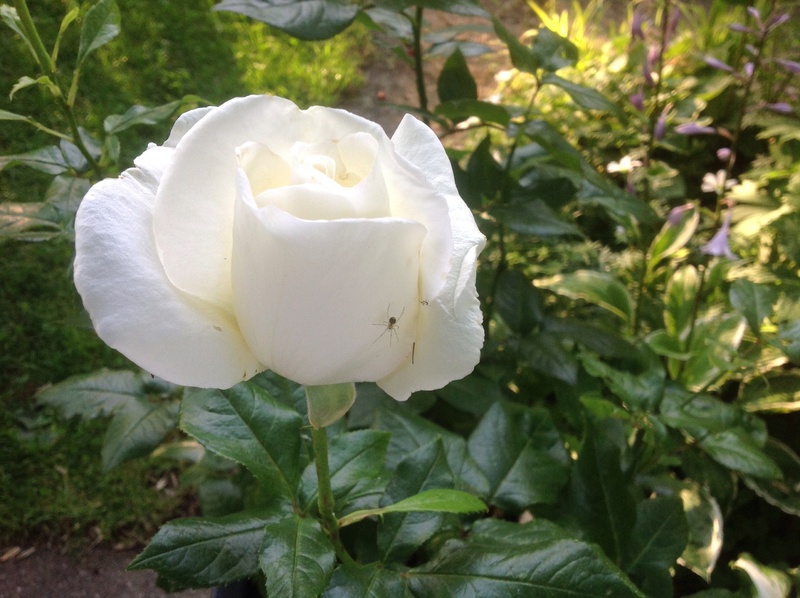 Thanks to our attempts to garden as organically as possible (we’d hate to lose our frogs), they seem to succumb to every disease known to roses. Black spot is not the half of it! But I keep persevering! And this year, if I can say so myself, I am so pleased with the results. So what, if in a months time, the black spot deprives me of all their leaves, I have the flowers now! So enjoy them I will! 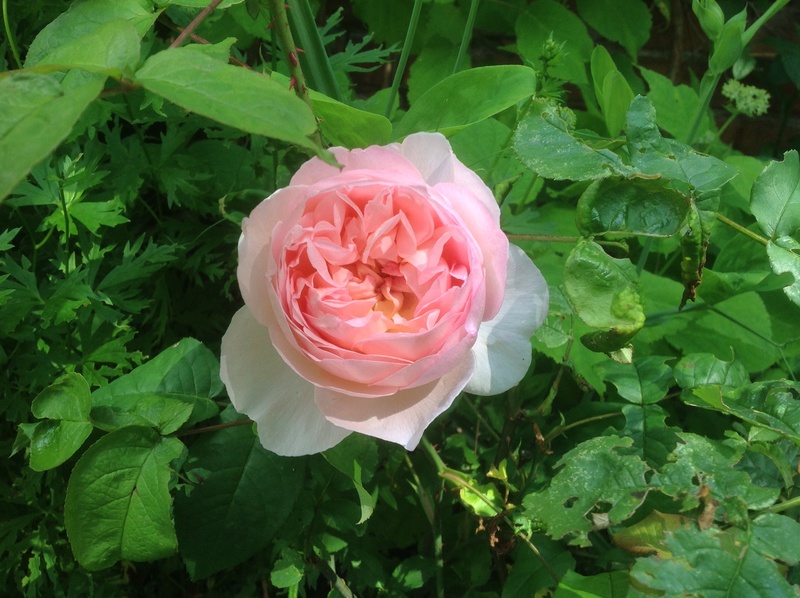 As some of you are probably aware, I’m a huge fan of David Austin’s English roses – they have the all important scent, in addition to the old fashioned form, as well as good disease resistance. Sounds like they have it all! 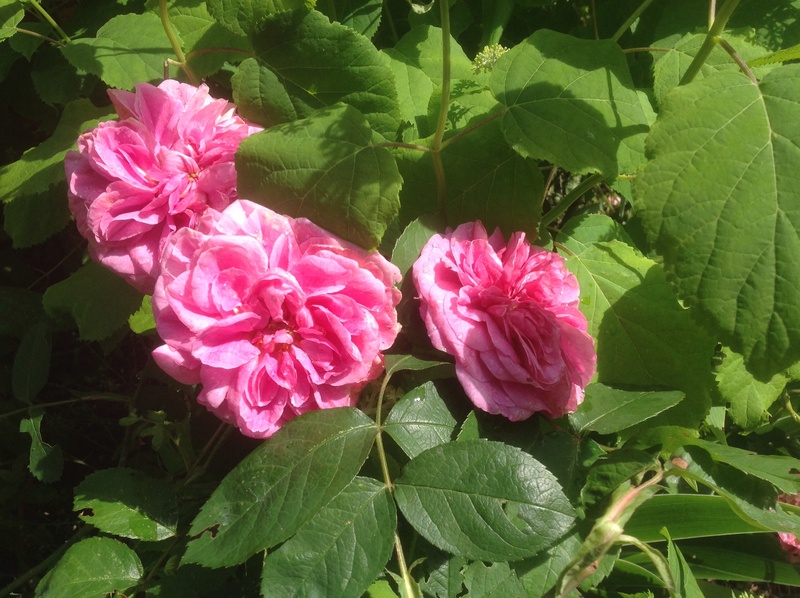 What a scent Gertrude has – like Turkish Delight! 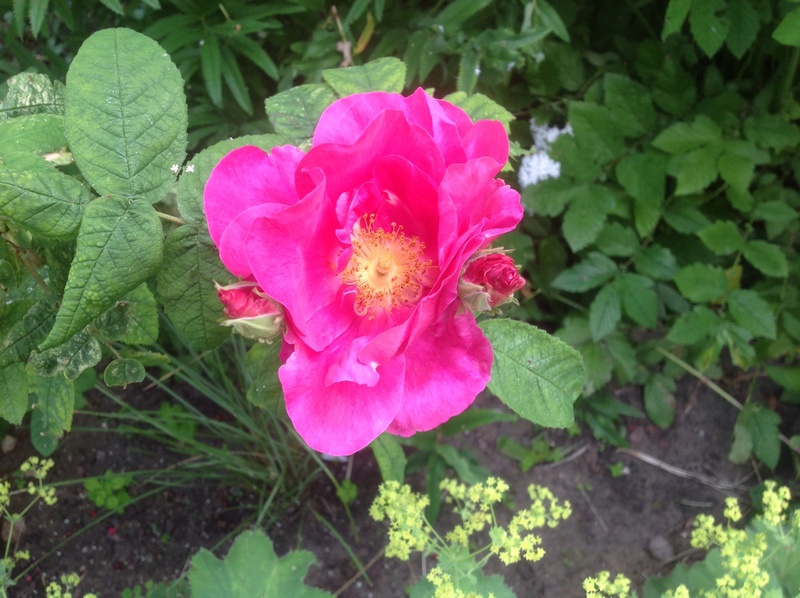 Also known as the “Apothecary’s Rose”, I bought this one many years ago, as the centre piece to the medicinal herb bed I was creating at the time. And it’s still looking good! This one is a Portland rose, reputed to be strong and disease resistant. Sadly, after 3 years, it’s not as strong and disease resistant as I’d hope. But it’s still giving us beautiful flowers! A rambler, it’s certainly doing that! Probably not in the best position for a rambler, but again, a great display. I’ll have to go in with the secateurs and a stout pair of gloves when it’s finished! This was a “must-have” for the scented shrub border! 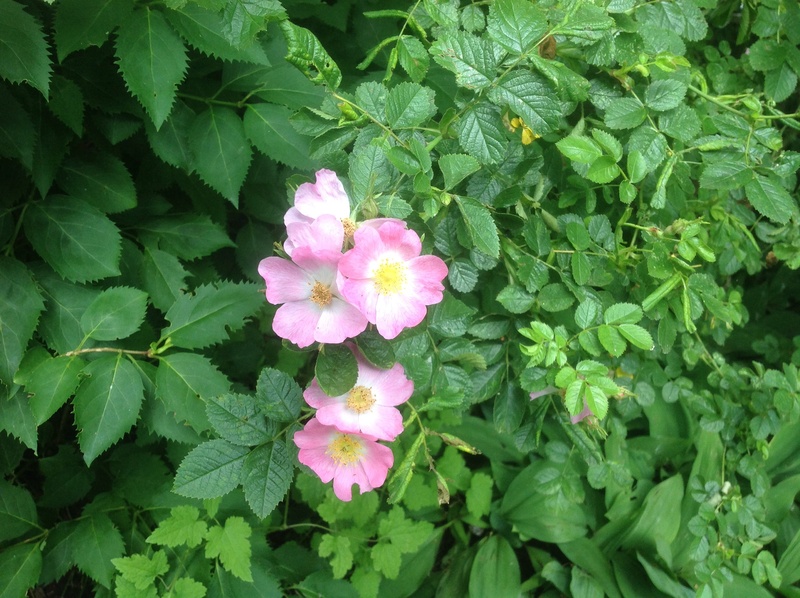 Not only do the lovely, simple pink flowers have a beautiful scent, so do the leaves. They give off a lovely fresh apple smell after it’s been raining. Bonus! 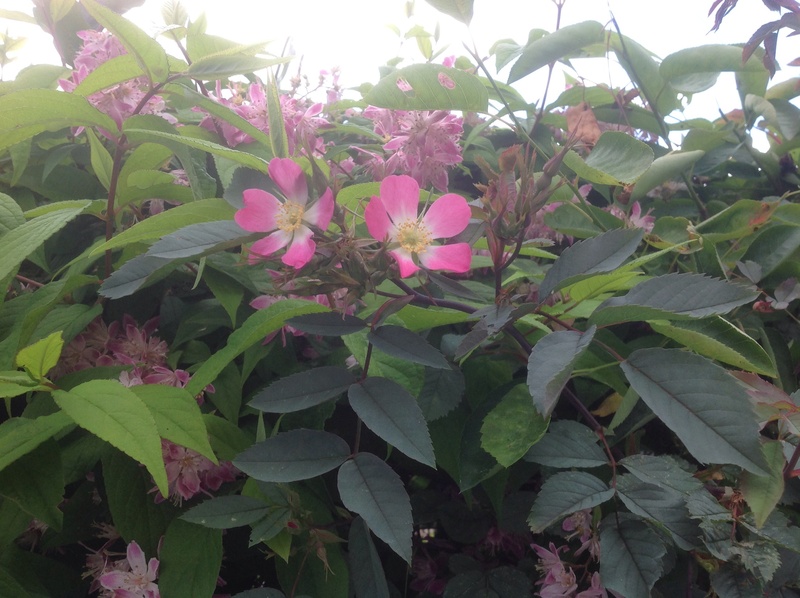 I prefer its alternative name of Rosa eglanteria. It’s also the famous Sweetbriar of old. 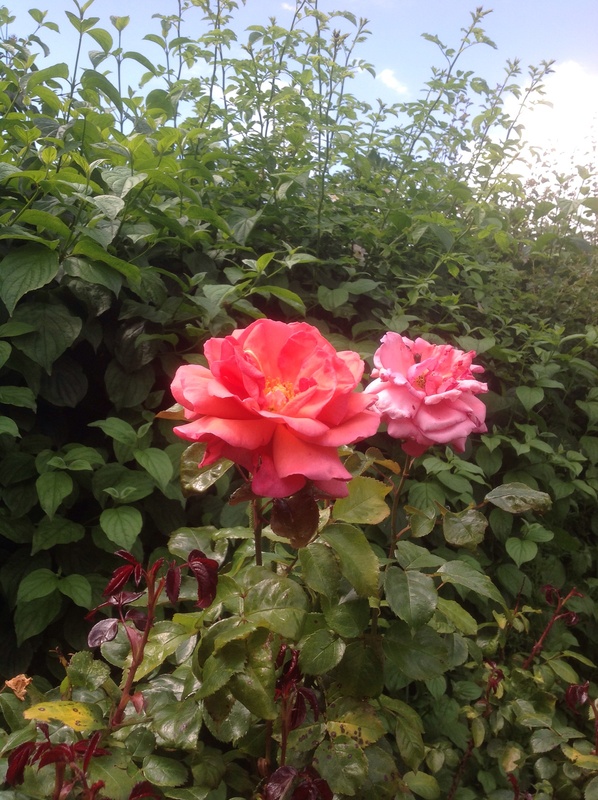 The next two roses are used in some of our hedges. R. glauca (or rubrifolia) is a flower arrangers dream, with its glaucous blue leaves and clear pink flowers – must try it! And this must follow on close, with its magnificent, red rosehips. It repeat flowers so well, even without deadheading, that you can get flowers and hips at the same time. 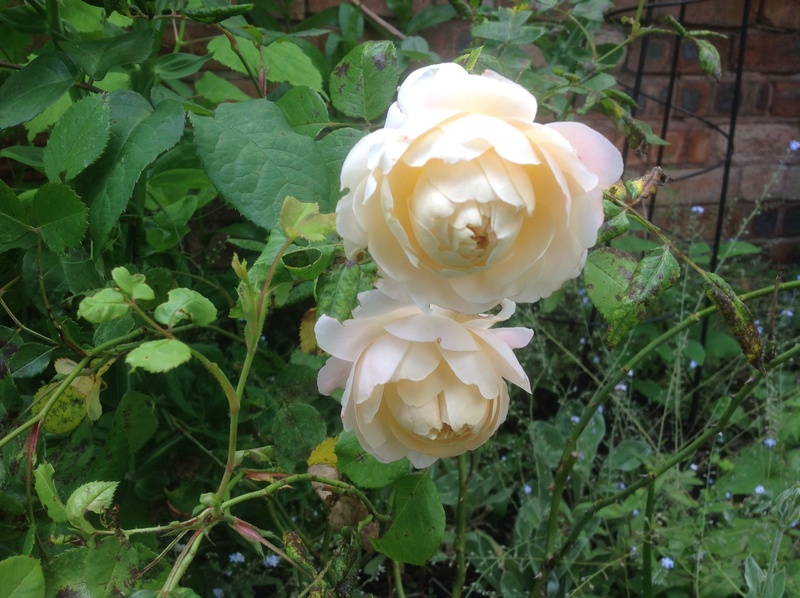 Admittedly, not my favourite type of roses – I much prefer old varieties – but these were bought for a reason, and their widespread appeal is now obvious to me. Bought for my grandad, a great gardener and Scotsman – and his middle name was Wallace! I hope you’ve enjoyed our rose garden. I’m off to enjoy it some more! 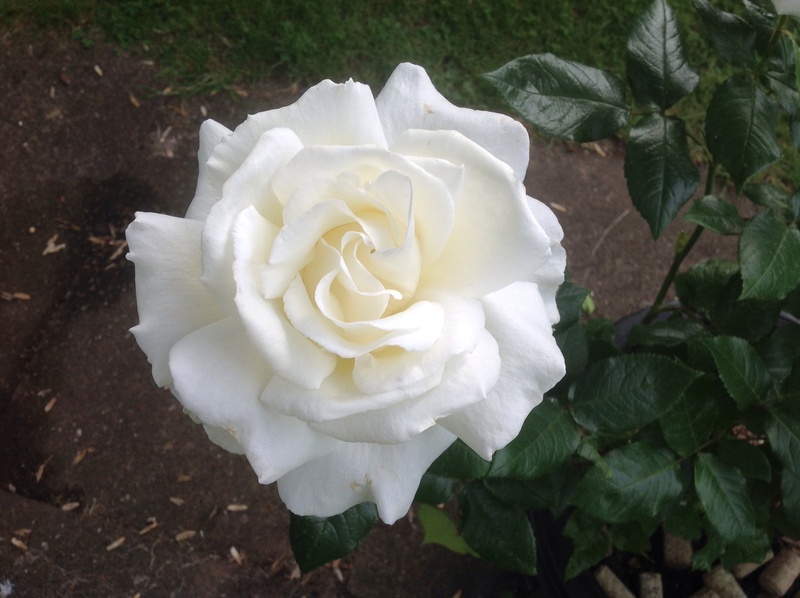 This entry was posted in The Scented Path and tagged Roses, Scented shrubs on June 24, 2014 by thelonggardenpath. At long last! The final stage of a seven year project! Our "Long Garden Path", runs down the middle of garden, through several "garden rooms" to the Woodland garden at the end. One of the "rooms" is our "Allotment", where we grow our fruit and veg. My aim was to attempt to make this an attractive feature in its own right. It has gone through several incarnations in its time, but hopefully, we have now settled on this plan. The roughly made raised beds and gravel paths were dispensed with as they were actually creating more problems for us. So we reverted to four larger beds – two on each side of the path. One pair of beds were for the soft fruits – one for berries, and the other for currants. I wanted both of these to be edged with box hedges, hoping for an attractive "Potager" effect! I planned to grow the box myself from cuttings and was prepared for a long wait. It could never be an overnight result. The first set of cuttings were started just over six years ago and they took well. After about 18 months I felt they were ready to plant up. 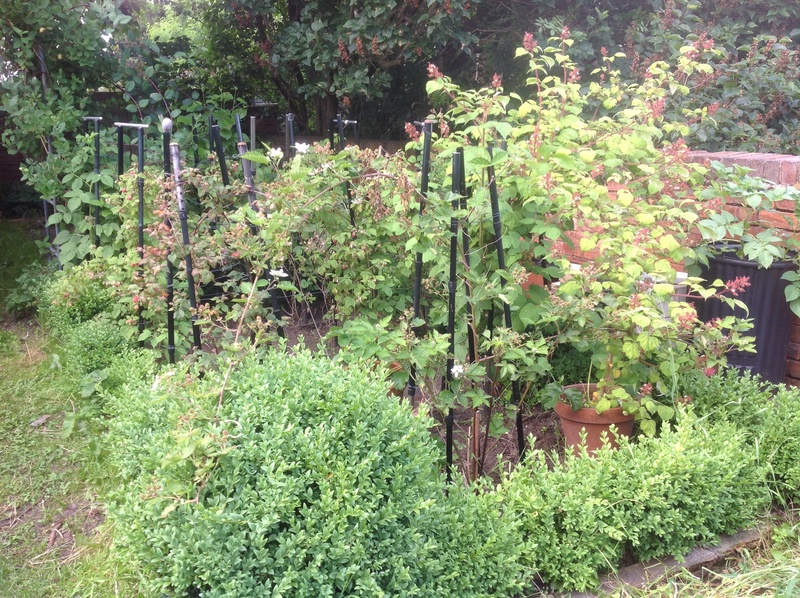 I had plenty of plants for one bed, the berries, with some left over as spares. However, there were not enough for both, so back to the start. Sadly, these cuttings did not seem to take so well for some reason. They seemed to sit there and sulk, neither growing nor dying. Eventually though, there were glimmers of hope, and I decided I was waiting no longer. They were going in! 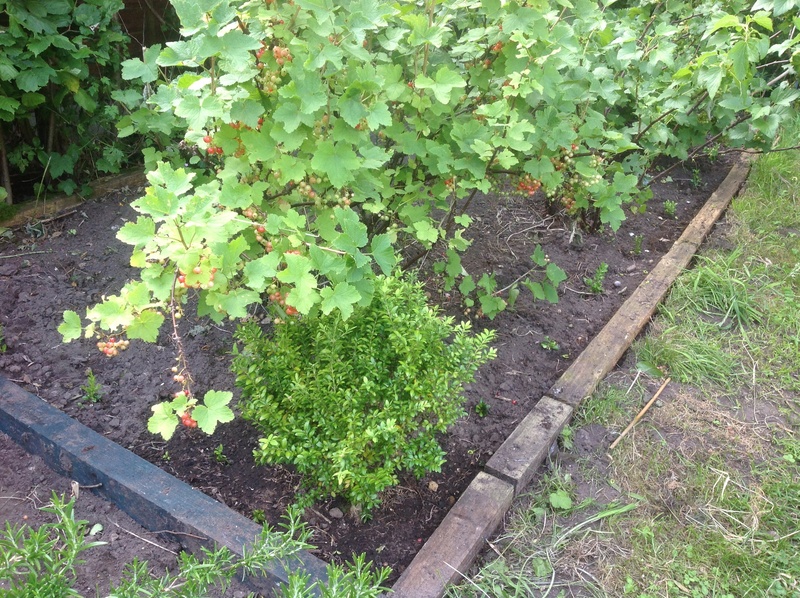 The currant bed was now complete! As you can see, I planted them up, but they are poor little things! They will need lots of T.L.C. After all, when you see the berry bed now, they have a lot of catching up to do! And now back to my topiary shears! 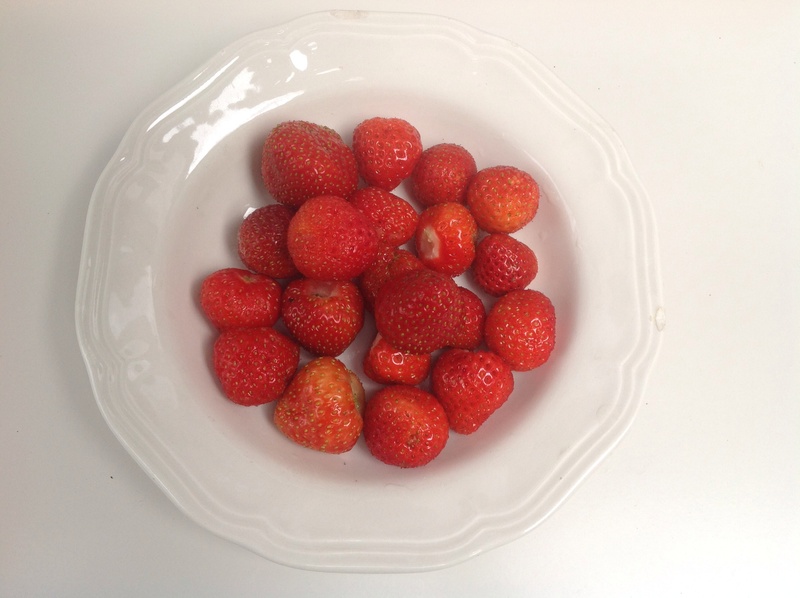 This entry was posted in Uncategorized and tagged Allotment, Box hedges, Soft fruit on June 20, 2014 by thelonggardenpath. This entry was posted in Uncategorized and tagged Wordless Wednesday on June 18, 2014 by thelonggardenpath. 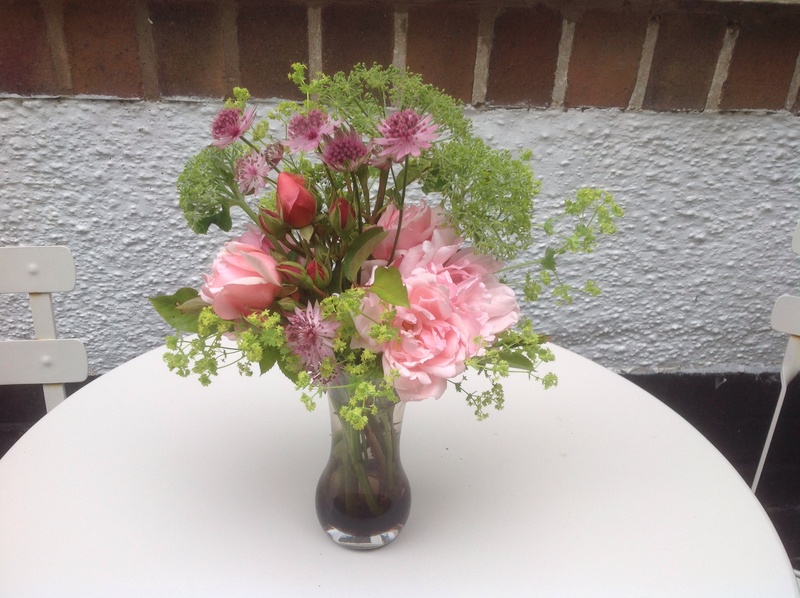 I had every intention to join in with Cathy at Rambling in the Garden, and her meme “In a vase on Monday”, but what with work and other commitments, I couldn’t get it together in time. With time to spare today, I went ahead with my next arrangement for my Cuttings Calender challenge (to have a continuous display of flowers or cuttings from the garden for a year). My “crate” of geraniums were going over, and needed to be replaced. I was desperate to use some of my cherished roses. I struggle to destroy the garden display by picking them for a vase, but “Albertine” is now very floriferous, and wouldn’t miss a few blooms. I wanted to arrange them among a “lemon/lime froth”, and for this I used some Angelica seed heads, along with some buds of Hydrangea “Annabelle”. 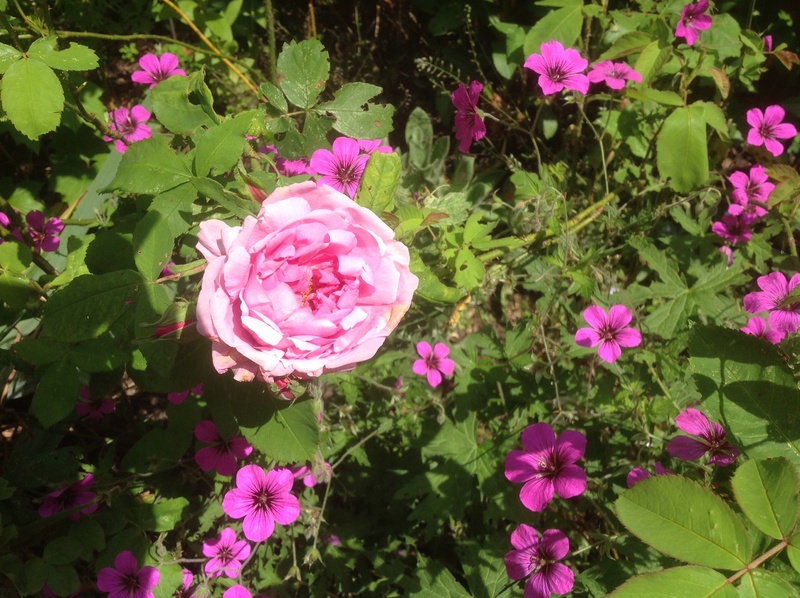 They are proving to create a wonderful combo, in the border, alongside Rose “Gertrude Jekyll”, so I thought it might work in a vase. Alchemilla mollis provided the bulk of the “froth”, and other pinpoints of pink were provided by Astrantia “Roma”. I have had so much inspiration from Cathy’s meme, and feel I’m starting to be more adventurous. I’m so chuffed with this result that I wanted to show it anyway – better late than never! This entry was posted in The Cuttings Calender and tagged cut flowers, Roses on June 17, 2014 by thelonggardenpath.